It provides a new interface with an improved Android and iPhone user experience with native apps for a more seamless and responsive user experience. Easy call forwarding setup from a smartphone such as set the status, login and logout of queues and alternate to new voice mails. It also contains network auto-sensing as this phone detects if it’s not on the LAN and changes its configuration automatically and easy one click auto provisioning as this phone can now be provisioned from anywhere. So your job is to simply click on a provisioning attachment. 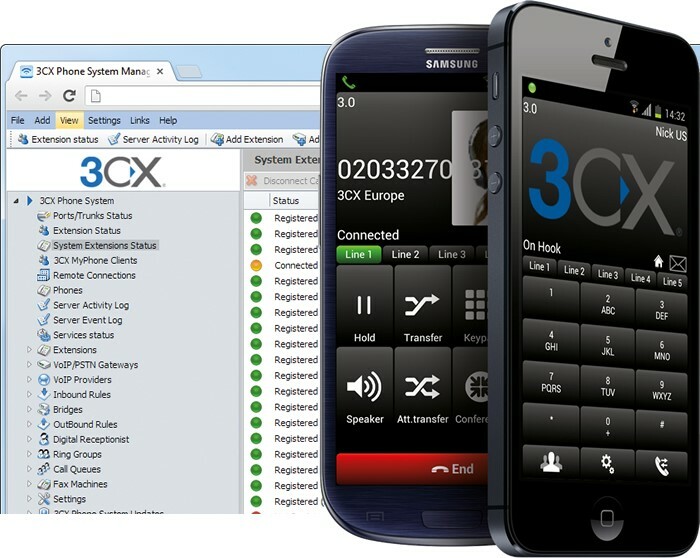 In addition to that it has improved DNS resolution for VOIP providers that use SRV records, updated 3CX Phone System Secure SIP / TLS implementation, included HTTPS for Abyss web server 64 bit only (full 3CX Phone System Uninstall and re-install is required) and has already fixed issues within 3CXPhone for Windows and even added company name to the Phone book with force re-provision that will reset and re-provision IP Phones and fixed bugs in outbound rules, included chat support for 3CX Phone for Android as well as Conference support for 3CX Phone for Android. It is available for all major platforms including Android 2.3 and up, tested on popular Android phones from Samsung, HTC, LG, Sony Ericsson, iPhone 3, 4 and 5, Windows 7 and 8. It also supports the PUSH mechanism, in which the client will be activated on an incoming call or chat message. In addition to this it also supports Hold or Resume calls as well as transfer calls.